Home to several charming wooden toy brands including Egg and Yolk, Goose Grease and Ostheimer, it’s Noc Noc’s own brand of rattles and teething toys which I think is something really special and the perfect addition to baby’s first toy box! 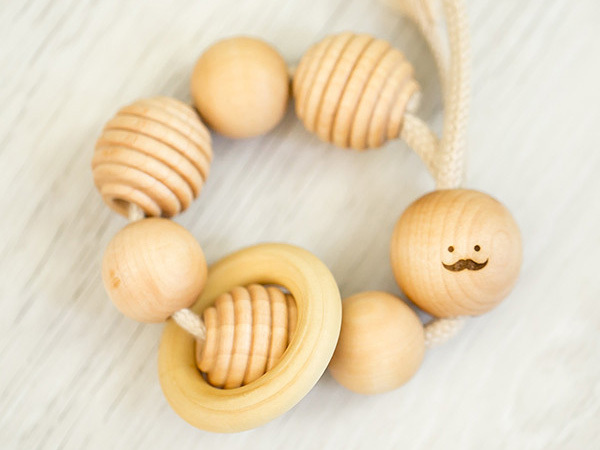 The Noc Noc Organic Wooden Teething Rattle ($35) is a perfect first baby toy. Not only is it gorgeous to look at in all its varying wood grain glory, babies will delight in curling their little fingers around the rings and giving it a good shake. While the aforementioned rattle is positively darling, it’s the Noc Noc Little Faces Organic Teething Shakers ($38 each) which have stolen my heart. Choose from three cheeky little faces – Sleepy Head, Mr Moustache and Bright Eyes. I wish you much luck in choosing just one! All Noc Noc wooden toys are lovingly handcrafted using sustainable non-toxic hardwoods and sealed with organic jojoba and beeswax cream to help keep them in tip-top shape and perfectly safe. Which is a great thing since children won’t be able to resist sinking their chompers into them! To see all the fun on offer, head on over to Noc Noc.